Pseudomonas aeruginosa (P. aeruginosa) is a highly drug resistant and opportunistic pathogen. Due to the permeability barrier in the outer membrane it is naturally resistant to many antibiotics. Infections caused by P. aeruginosa are increasing both in hospitals and in general community and it has been reported as one of the principal causes of nosocomial pathogen, particularly among immuno-compromised patients (1). Concurrently, the extensive use of antimicrobial agents and the evolutionary antimicrobial resistance strategies of bacteria have resulted in the emergence of pan-drug resistant bacteria (2). The efficacy of many antibiotics for treatment of infections has become quite limited due to the development of resistance and the threat from antimicrobial-resistant organisms is accumulating and accelerating. (3). Also, the development of resistance to monotherapy is a common problem and dual antimicrobial coverage is often a necessity in Pseudomonas infections (4). Attempts have been made to deal with this problem by using combination therapy (5). Several studies have reported on the interaction of antimicrobial combinations with multi-resistant planktonic strains of P. aeruginosa (6, 7). It is also reported that complete eradication of the bacterial cells of Pseudomonas aeruginosa in biofilms is a therapeutic challenge and often results in recurrent and chronic infections (6, 7, 8). Recently, Černohorska demonstrated the in vitro effect of 8 antibiotic combinations in P. aeruginosa biofilms, using biofilm susceptibility testing (8). Earlier, Neu reviewed the data available on the combinations of fluoroquinolones with other antimicrobial agents against several bacteria including P. aeruginosa (9). Also, Vancomycin in combination with cephalosporins and penicillins has been shown to synergistically inhibit a number of gram-negative bacilli (10). However, the threat from antimicrobial-resistant organisms is accumulating and accelerating (11). With the dearth of new antibiotics coming to the marketplace and the advance of MDR bacteria it is not difficult to see untreatable life-threatening bacterial infection becoming common (12). Moreover, it is difficult to identify strategies to prevent or delay the emergence of resistance. Recently, Amyes et al., discussed on the principles for antibiotic usage to limit resistance development (13). Thus, there is the need to find new ways to control P. aeruginosa and embark on the need for a continued search for new antimicrobial compounds. Chitin is a natural organic material which is the second most abundant to cellulose. It is biocompatible, biodegradable and can be obtained from exoskeleton of animal sources particularly in crustacean, mollusks and insects and certain fungus. When chitin is deacetylated, a group of polymers collective known as chitosan are obtained. Various applications of chitosan polymers ranging from water treatment, pulp and paper industry, to pharmaceutical, cosmetics, agriculture, food, membrane are proposed (14). The oral mean lethal dose for chitosans in mice is found to be in excess of 16 gm/day/kg of body weight, which is higher than that of sucrose (15). Antimicrobial activity is one of the attractive features of chitosan. The antimicrobial activity of chitosan varies depending on their physical properties (degree of deacetylation (DD), and molecular weight), solvent, microorganism species and source. 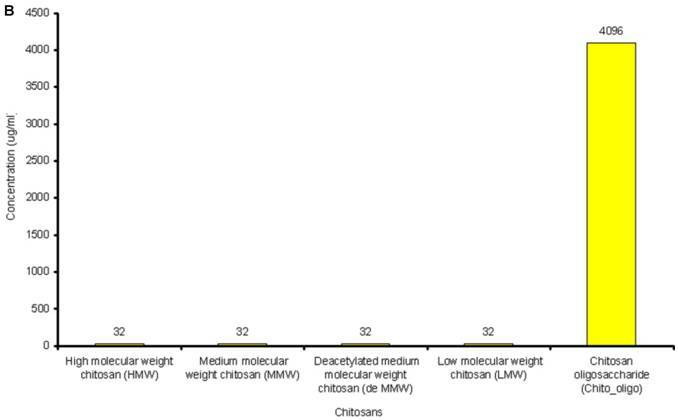 The antimicrobial activity is reported to vary depending on the methods involved in preparation of different DD and molecular weight of chitosan (16, 17, 18, 19, 20, 21). Isolated reports are available on the use of combinations of antibiotics and chitosan and its derivates as antimicrobials. Decker et al. proposed on a synergistic chlorhexidine/chitosan combination for improved antiplaque strategies (22). Tobramycin is one of the antibiotics which is reported to show synergistic action with chitosan in planktonic culture of Pseudomonas aeruginosa (23). Bioadhesive and antimicrobial properties of chitosan and its derivatives are effective in antimicrobial drug delivery control - release of Chlorhexidine and Nystat in oral preparation (24, 25, 26), release of ampicillin (27) and drug delivery system for Ofloxacin (28) in ophthalmic preparation. Tobramycin sulfate gastrointestinal release preparations (29) make chitosan attractive for combination with antimicrobial drugs. In this paper, the activity of Tetracycline, Sulfamethoxazole, Trimethoprim, Clarithromycin, PolymycinB, Ceftriazone, Chloramphenicol, Tobramycin, Ofloxacin and Streptomycin are investigated when used in combination with different degree of deacetylated chitosans and its derivative Chitosan oligosaccharide against strains of P. aeruginosa. High molecular weight Crab chitin was purchased from Bioline, Thailand. The crab chitin was deacetylated by Technique of Horowitz (31) and the degree of deacetylation was measured by FT-IR spectroscopy. Medium molecular weight chitosan (75 - 85 % deacetylated) was purchased from Sigma- Aldrich. Medium Molecular weight chitosan (>90 % deacetylated) was further deacetylated by technique of Horowitz and the degree of deacetylation was measured by FT-IR spectroscopy. Low molecular weight chitosan (75-85% deacetylated chitosan) was purchased from Sigma-Aldrich. Chitosan oligosaccharide lactate (>90% deacetylated) was purchased from Sigma-Aldrich. Antimicrobial powders of Clarithromycin (assay value >95% HPLC), Chloramphenicol, Ceftriaxone, Ofloxacin (assay value 99%), Polymycin B (assay value 60-70%), Sulfamethoxazole (assay value 99.9% HPLC), Streptomycin (assay value 98%), Tobramycin (assay value 98% TLC), Tetracycline (assay value 99%) and Trimethoprim (assay value 99% HPLC) were used. Stock antibiotic solutions were prepared and dilutions made according to the CLSI (Clinical Laboratory Standardization Institute) method or manufacturer's recommendations (30). The solvents and the diluents used for the preparation of stock solutions are listed in Supplementary Table 2. The lowest concentration of the antimicrobial agent that inhibits the growth of the microorganism being tested as detected by lack of visual turbidity, matching with a negative control included with the test, is known as Minimum Inhibitory Concentration (MIC). The MICs for the antibiotics and chitosans under study were determined in duplicate by the microbroth dilution method in ISO-Sensitest Broth according to CLSI (Clinical Laboratory Standardization Institute) (30). The antibiotic concentrations used in this experiment ranged from 0.007µg/ml to 4049µg/ml depending on the MIC of the antibiotics. 1024µg/ml to 4 µg/ml of chitosan solutions was used and 67536µg/ml to 128 µg/ml of Chitosan oligosaccharide was used to determine the combinatorial effect of chitosans with the antibiotics. (Figure 1A and Figure 1B). Two sets of test were performed in the determination of MICs for chitosans. One with chitosans dissolved in acetate buffer and second set (control) with same volume of acetate buffer without chitosan. P. aeruginosa suspensions were incubated at 37 degree Celsius for 20 to 24 hours at ambient air. The effect of acetate ion on P. aeruginosa was determined by analyzing bacterial growth by spectrophotometric analysis at 600nm (checking the turbidity when compared with negative control) (Figure 2). Checker board titration is one of the most frequently used techniques to access drug interactions. Testing was performed utilizing 96 well microtiter plates. MICs were determined for each drug by broth microdilution according to standards of the CLSI (Clinical Laboratory Standardization Institute) (30). Each combination assay was performed at three times. Synergism by the checkerboard method was defined as an FIC index of ≤ 0.5, additive effect was defined as an FIC index of > 0.5 and ≤ 1, Indifference effect was defined as an FIC index of > 1 and ≤ 2 and antagonism effect was defined as an FIC index of > 4. Concentrations within the FIC panel were such that the MIC of each antibiotic was in the middle of the range of concentrations tested. 1. The FIC for a drug in a given well is derived by dividing the drug concentration in the given well by the control MIC of the test organism to that drug. Plate counting was performed to quantitate the log concentration of bacteria colony forming unit (CFUs) per milliliter, using the final concentration of the antibiotics and chitosans that showed synergism derived from checkerboard method (Figure 4). Antibacterial activity of acetate buffer showing acetate ions concentration verses OD at 600nm. 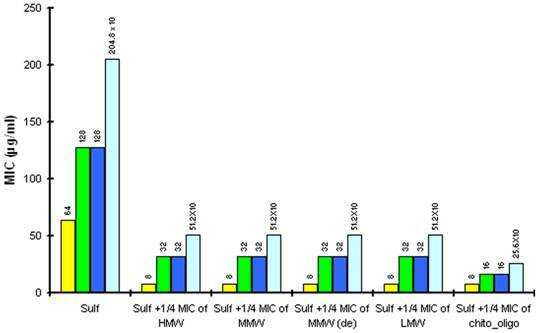 The reduction in MIC of Sulfamethoxazole (sulf) after combination with ¼ MIC of chitosan (8µg/ml) and ¼ MIC of Chitosan oligosaccharide (512 µg/ml) against different strains of P.aeruginosa. Yellow is P aeruginosa ATCC15279; Blue is P aeruginosa PT121 ; Cyan is P aeruginosa PT149 and Green is P aeruginosa PAO1. The antimicrobial activity of acetate buffer was investigated to evaluate the antimicrobial activity of chitosans which are only soluble in acetic acid. 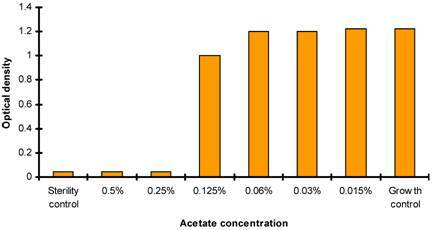 The antimicrobial activity of acetate buffer was observed at acetate ion concentration of 0.06% in control sets. It should be noted that at the concentration of 32µg/ml, MIC of chitosan for all P. aeruginosa strains, the concentration of acetate ion is less than 0.03%. Thus, the antimicrobial action of chitosans exceeded that of acetate buffer in the test (Figure 2). The antibacterial activity of the chitosan at culture media pH< 6 has earlier been performed (31, 32, 33). The susceptibility range of the P. aeruginosa species was evaluated using 10 antibiotics (Tetracycline, Sulfamethoxazole, Trimethoprim, Clarithromycin, PolymycinB, Ceftriazone, Chloramphenicol, Tobramycin, Ofloxacin and Streptomycin) and 5 chitosans (HMW, MMW, De MMW, LMW and chitosan oligosaccharide). MIC values are shown in Figure 1A. MIC value is found to be lowest for Tobramycin (0.25µg/ml) and highest for Chloramphenicol (128µg/ml). It is observed that MIC for all the chitosans is 32 µg/ml except chitosan oligosaccharide which shows an MIC value of 4096 µg/ml. 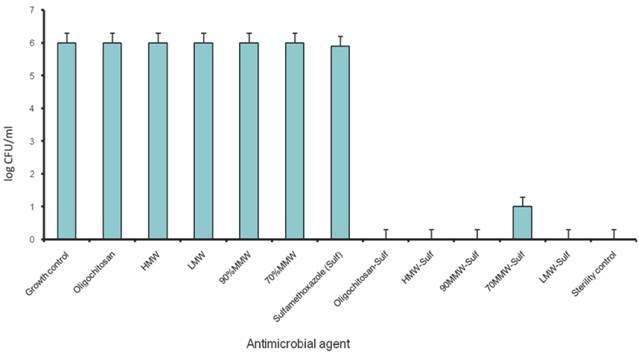 This shows that chitosan oligosaccharide is not an effective antimicrobial agent when compared with the other chitosans under investigation (Figure 1B). The antimicrobial activity of chitosans and Chitosan oligosaccharide against P. aeruginosa strains are shown in Table 1. Antibacterial activity against P. aeruginosa starts at a concentration of 32µg/ml. The results show that all the five chitosan preparations had antibacterial activity against four different strains of P. aeruginosa. Similarly, Chitosan oligosaccharide displayed the anti bacterial activity against all the four P. aeruginosa strains at a much higher concentration (4096µg/ml). MICs of compounds under investigation for different strains of P.aeruginosa. HMW= High molecular weight chitosan; MMW = Medium molecular weight chitosan; MMW (de) = Deacetylated medium molecular weight chitosan ; LMW= Low molecular weight chitosan; and Chitosan_oligo = Chitosan oligosaccharide. In checkerboard assay, the combination of the above mentioned antibiotics and different chitosan preparations and Chitosan oligosaccharide show synergistic action with Sulfamethoxazole against P. aeruginosa ATCC15729. 8µg/ml of four chitosan preparations and 512 µg/ml of Chitosan oligosaccharide effectively combine with 8 µg/ml of Sulfamethoxazole (Fractional Inhibitory Concentration, FIC index = 0.375). The remaining combinations show additive effect in the checkerboard assay. (FIC index 0.5 - 1.0). The ΣFIC data are shown in the table 3. 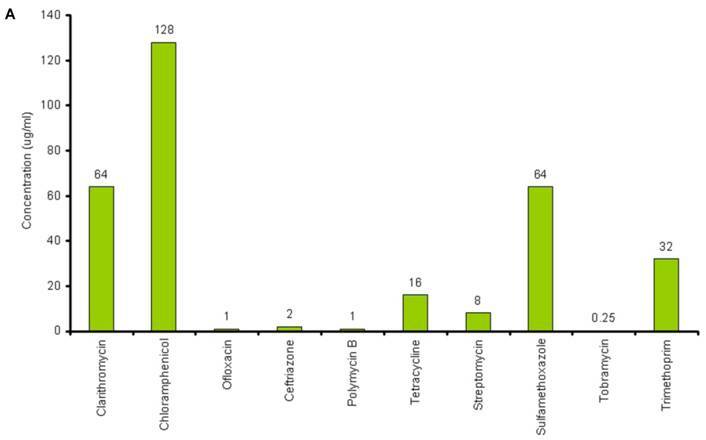 The identified synergistic combinations of Sulfamethoxazole / chitosan and Sulfamethoxazole / Chitosan oligosaccharide were further investigated with three different clinical strains of P. aeruginosa PAO1 wild type, PT121 and PT149 strains (Please see materials and methods for details). Chitosan and Chitosan oligosaccharide were found to have synergistic effect when combined with Sulfamethoxazole against all the three Pseudomonas strains. 8 µg/ml of four chitosan preparations synergistically combined with 32 µg/ml of Sulfamethoxazole (FIC index = 0.25) and 512 µg/ml of Chitosan oligosaccharide with 16 µg/ml of Sulfamethoxazole against PAO1, PT121 and PT149 strain (FIC index = 0.375). (Table 2, Figure 3.). The results were also confirmed by population analysis for P. aeruginosa ATCC strain (Figure 4). FIC index for different combination of Sulfamethoxazole with different chitosan preparations against four strains of P. aeruginosa. Sulf = Sulfamethoxazole. HMW= High molecular weight chitosan; MMW = Medium molecular weight chitosan; MMW (de) = Deacetylated medium molecular weight chitosan ; LMW= Low molecular weight chitosan; and Chitosan_oligo = Chitosan oligosaccharide. FIC values of different chitosans and different antibiotics. HMW= High molecular weight chitosan; MMW = Medium molecular weight chitosan; MMW (de) = Deacetylated medium molecular weight chitosan ; LMW= Low molecular weight chitosan; and Chitosan_oligo = Chitosan oligosaccharide. P. aeruginosa is an important bacterial pathogen most frequently responsible for nosocomial infections. It is often resistant to many antibiotics used in causative therapy. The efficacy of many antibiotics for treatment of severe infections has become quite limited due to the development of resistance. Improving the effectiveness and decreasing the toxicity of antibiotics are the two basic objectives in the development of novel antimicrobial agents. Utilization of combination therapy is one of the contemporary approaches for successful modulation of existent antibiotics (34). Many published data indicate that chitosan and its derivatives have certain in vitro antibacterial activity. Recently, Raafat et al., proposed that there might not be a single classical target that would explain chitosan's antimicrobial action, and speculated that binding of chitosan to teichoic acids, coupled with a potential extraction of membrane lipids (predominantly lipoteichoic acid) results in a sequence of events, ultimately leading to bacterial death (35). Earlier it was also shown by electron microscopy that chitosan caused extensive cell surface alterations, bound to the outer membrane and caused the loss of the barrier function of the outer membrane (36). However, till date, its exact mode of action remains obscure. Nonetheless, it is clear that its diverse physical properties in combination with antimicrobial activities make it and its derivatives applicable in different function in pharmaceutical preparations. Our results reveal the importance of chitosan and its derivatives as they have strong antibacterial activity against resistant bacteria like P. aeruginosa. Furthermore, these chitosan derivatives are active against antibiotic resistant bacteria at very low concentration (32µg/ml). The MIC of Chitosan oligosaccharide (2046µg/ml) is higher than that of other chitosan preparations. This is in agreement with earlier report by Jeon et al. (23). It must be noted that the MIC concentrations are much below the toxicity level. It has been reported earlier in an in vivo study, that chitosans have no evidence of toxicity (9) and the LD50 of chitosan in mice is 16g/kg of body weight(25). When in combination with Sulfamethoxazole, sub MIC concentrations of chitosan (8µg/ml) and Chitosan oligosaccharide (512µg/ml) can effectively inhibit the growth of various Pseudomonas strains. The presence of antibacterial activity against P. aeruginosa ATCC15279 was seen at Sulfamethoxazole concentration as low as 8 fold (8 µg/ml) of its MIC. Antibacterial activity against three different clinical strains PAO1, PT121 and PT149, shows synergistic behavior suggesting that chitosan and Chitosan oligosaccharide are promising compounds for combination antimicrobial therapy against drug resistant pseudomonal infections. In P. aeruginosa PT149, the MIC of Sulfamethoxazole was found to be 5 fold higher than the remaining strains suggesting that Sulfamethoxazole might be effluxed by the MexEF-OprN system, thereby reducing the effective concentration of the folic acid biosynthesis inhibitor. Thus, the reduction in drug accumulation is more apparent in the MexEF-OprN overexpressor. Although, Sulfamethoxazole has high MIC, chitosan and Chitosan oligosaccharide remain effective against this mutant strain either singly (MIC of 32 µg/ml and 4096 µg/ml respectively) or in combination (8 µg/ml of chitosans lower the MIC of sulfamethoxazole to 512µg/ml and 512µg/ml of Chitosan oligosaccharide lower the MIC of sulfamethoxazole to 256µg/ml). These finding provide a strong evidence that chitosans and Chitosan oligosaccharide are promising candidates for combination therapy against multi drug resistant P. aeruginosa infections. From the results of FIC index , Chitosan oligosaccharide proves to be a better combination for Sulfamethoxazole against P. aeruginosa , as the FIC index are relatively lower than that of four different preparations of chitosan. These in vitro data still need to be validated by assessing the clinical performance of antibiotic combinations. These findings could also prove to be a promising alternative in the treatment of patients for whom existing antimicrobial treatment fails. Despite the lack of knowledge for the underlying mechanism of the synergistic effect of Sulfamethoxazole-chitosan and Sulfamethoxazole-Chitosan oligosaccharide combinations, the potential for use of such combinations clinically is huge since it may be able to make some untreatable resistant infections treatable at currently recommended dosages that are often marginally effective against resistant strains when used alone. These data encourage further studies with chitin derivatives and other antimicrobial classes and in vivo animal experiments to validate these interesting findings before clinical tests can move forward. We would like to thank Dr. Thilo Köhler, Department of Genetics and Microbiology, Switzerland for providing the PA01, PT121 and PT149 bacterial strains of P. aeruginosa. Dr. M.K.S. would also like to thank the BMERC for providing the seed funding to carry out this work. We would also like to thank Ms. Neha S. for helping with proof-reading the manuscript and literature survey.